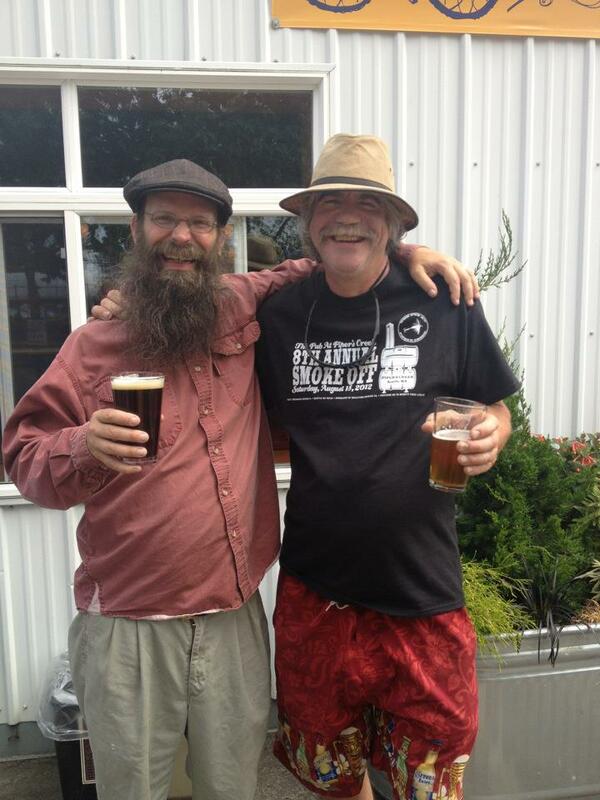 To say Jim Parker was a legend on the Northwest beer scene is an understatement. The beer world lost a giant last week when Jim succumbed to the effects of a stroke that he suffered in November. He passed last Tuesday, February 5th, surrounded by family and loved ones. Everyone hoped and assumed that he’d endure the long road to recovery, but that’s not how it worked out. His career in beer stretched across time and space, from Colorado in the earlier years of craft beer to his more recent history in Washington and Oregon, where he spent the last two decades of his life. Primarily, he was a publican, a brewer, and a beer sales guru. 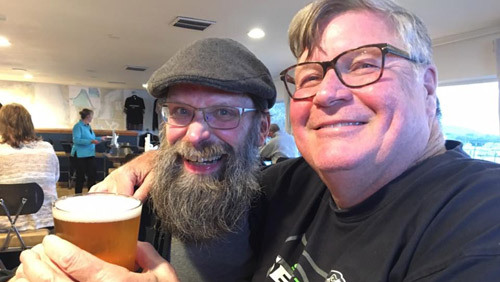 Among his many other contributions to the region’s beer scene, Jim served as the executive director of the Oregon Brewers Guild for six years. Above, Jim with Skip Madsen. Skipper and his Little Buddy. Two legends reunited. In Oregon he worked at, or in some way helped open, places like Concordia Ale House, Horse Brass Pub, The Green Dragon, Oaks Bottom Public House, and others. As far as breweries are concerned, Jim worked in some capacity with Chuckanut Brewery, Kulshan Brewing, Baerlic Brewing, pFriem Family Brewers, North Jetty Brewing, Fort George Brewing, Wayfinder Beer, and others. Most recently, he’d been working on a new project with David Lederfine and Asher David Brewing and Cellarworks. Coincidentally, David Lederfine is an old friend of mine. And by “old friend” I mean that we played little league baseball together. Just another example of how Jim Parker was everywhere and knew everyone. Last April, I ran into Jim at Salt Pub in Ilwaco, Washington. Unexpected, totally random encounter. As usual. I didn’t know that would be the last time I’d see him. Glad I saw him, sorry it was the last time. Oh, and one last thing. Apparently Jim is credited with inventing the Totcho. You know, nachos made on a bed of tater tots instead of chips. A man of great vision and many talents! More than anything else, Jim Parker was one of the nicest people you’d ever hope to meet. There was no way in hell you couldn’t like the guy. He will be missed. According to those closest to Jim, a celebration of life will take place later this year when the weather turns, so we can drink beer and listen to music outside, as he would have wanted. A fixture, a character and a deserving legacy. Cheers Jim and thanks. Jim Parker, one of the best people I’ve ever met… Worked for him at the Mountain Tap in Fort Collins, CO, with him when we decided all the little guys publishing newspapers in Ft C should band together (Jim Parker and AJ Feldmann with the Rocky Mountain Brews, me and Ken O’Hearn with the Beat, and Dave Miller with the Comic News, and Dave Bacon soon) – gosh when was that? 1995? our collective formed one of the “first” multimedia and Internet app companies, we did the Broncos website the two years they were champs…. He was my roommate for awhile, too. One of the funniest mothertruckers you’d ever meet, but also genuinely compassionate and widely knowledgable… A guy that could make you laugh when stuff wasn’t really funny to you….